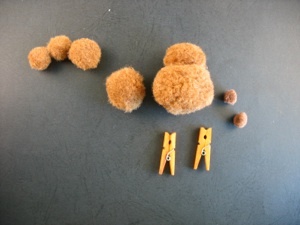 A glue gun is the easiest way to fasten the pompoms together, but glue guns are a little dangerous for children to use. If you do use glue guns, be sure to use low temperature ones, and perhaps have an adult be the one to put the glue on, then the kids can press the balls together. The alternative is to use white glue, and hold it in place till it dries, which can take a long time. Glue dots may work well but I haven’t had a chance to test them on pompoms. 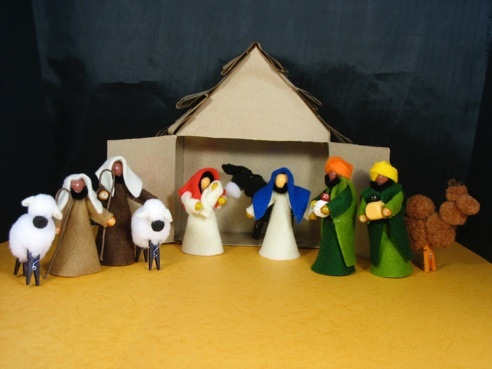 These animals are the perfect accompaniment for nativity sets, or they can be used as Christmas tree ornaments, These animals are top heavy and do tend to be tipsy, so they can be a bit frustrating for children to try to make them stand. A helping hand from an adult may be all they need. 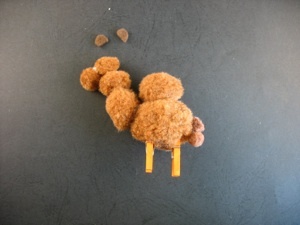 If you spread the front legs toward the front, and back legs toward the back, they do seem to stand better. 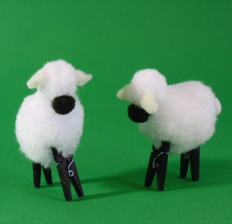 If it is still a problem, you may want to re-clip the legs to the body to make sure the front and back legs are lined up well. 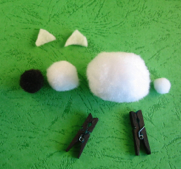 Clip the clothespins to the body for legs. 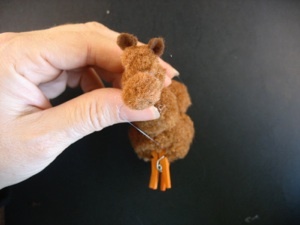 The long neck and head on the donkey make it front heavy, so it is easy to tip over. If you splay the legs to the front and back, it seems to make it easier to stand up. 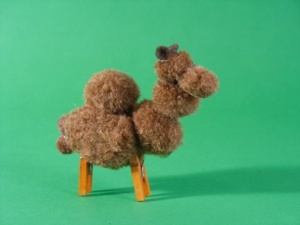 Keep fiddling with the legs until it can stand. 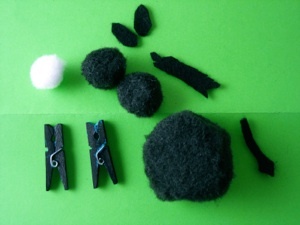 1.You will need one large and 2 small black (or grey) pompoms, one small white pompom, 2 mini clothespins, and a bit of black felt. 4.Color the 2 clothespins black (or grey) with a permanent marker or acrylic paint. 5.Clip the 2 clothespins to the bottom of the large pompom (the body.) 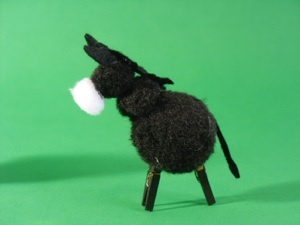 Keep moving the legs around until the donkey can stand--it seems to help to make the the front legs slightly tilted forward, and the back legs stretched slightly back. 3. 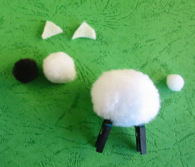 Glue a small white pompom (the head) to the large pompom (the body). 1.Color 2 clothespins black with permanent marker. 4. 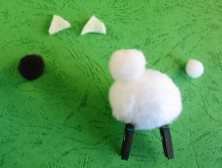 Glue the black pompom to the small white pompom to form the face--it looks best if it is toward the bottom of the small pompom so it looks like it is looking down. 5. 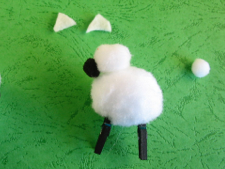 Glue the smallest ball to the back of the body to form the tail. 6. Cut 2 small triangles out of white felt for ears. 7. 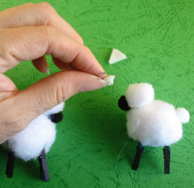 Pinch the ears in half and glue them to the head so they are tipping down a bit--you may need to trim the folded ear to get the right angle against the head. 2. Glue the small black ball (the face) to the head. 3. 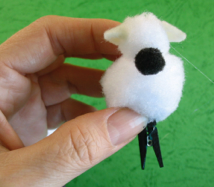 Make 2 front legs--cut 2 short strips of felt, fold them in half, and glue them to the front of the body. 4. Cut 2 small triangles out of felt for the ears. 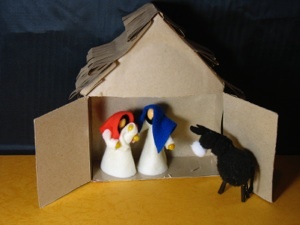 Fold the ears in half and glue the ears to the head so they tip down a bit. 2. 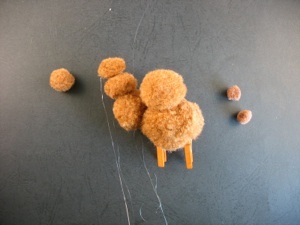 Glue another medium sized pompom to the front of the body as part of the neck. 4. 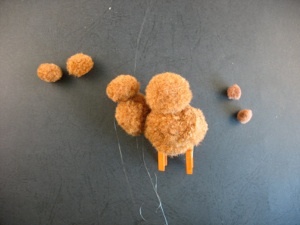 Glue 2 small brown pompoms to the neck to form the head (the first one should go on the top of the neck, but the nose section should be glued to the front of the head, not on top of it. 5. 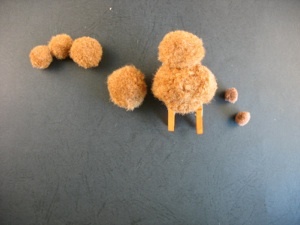 Glue the 2 tiny pompoms to the back of the body to form the tail, or cut a tail from felt. 6. 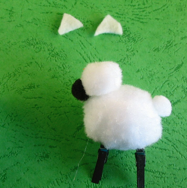 Cut 2 small half circles out of felt to form the ears. 7. Fold an ear in half, and glue it to the top of the head. 8. Repeat to glue the other ear on. 9. Pull all the strands of glue off, if you have been using a glue gun. 10. Optional: glue on black beads for eyes. 3. 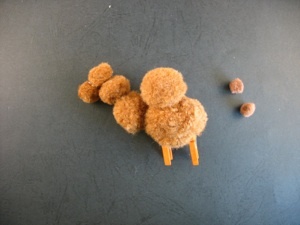 Glue a smaller sized pompom to the top of the first neck pompom to make the neck longer. 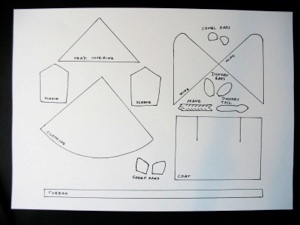 Download pattern for ears and tails--for donkey, sheep, and camel. 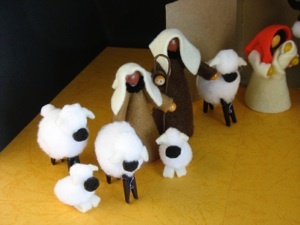 These lambs are lying down, but they still need legs. Without them, they will topple over because they are too top heavy. 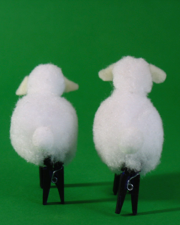 Make two legs of small strips of felt, and they will stay upright. 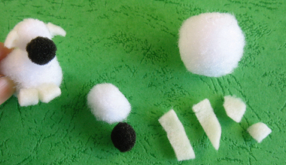 Don’t throw tiny scraps of felt away since you can use even the tiniest bits!